Since 2016, Alpha Poly Packaging Solutions has been awarded over $275,000 in Ontario training grants. The manufacturer accessed third-party training programs to help employees work more systematically and improve productivity at its facility in Brampton, Ontario. By identifying funding opportunities early on, the company has successfully optimized the impact of its workforce development initiatives. To support its commitment to productivity improvements, Alpha Poly leveraged funding for workforce development through the Canada-Ontario Job Grant. Government funding has helped offset the cost of productivity and quality assurance training programs that allow the company to address current gaps in its operational performance. We recently spoke with Alpha Poly’s Vice-President of Administration and Finance, Martin Boeykens, who shared great feedback regarding the company’s success with government funding. Martin discussed how Mentor Works simplified and accelerated the funding process, allowing the company to expand the scope of its productivity improvement projects. Since 1989, Alpha Poly Packaging Solutions has been developing flexible packaging solutions for food service, pet care, and other industrial sectors. The manufacturer is recognized for its commitment to exceptional quality and use of state-of-the-art high definition technology. In recent years, the business has been dedicated to improving the skills of its 60 employees to better meet consumer demands. In 2016, Alpha Poly’s executives identified that it was time to invest additional resources to help boost productivity. To successfully perform this task, the company leveraged $275,332 in training grants through the Canada-Ontario Job Grant to support workforce development. Accessing training programs has helped the company improve its operational efficiency, quality management standards, and cross-departmental communication skills. By partnering with Mentor Works, the business has identified multiple government funding opportunities to support its growth-oriented projects. The Canada-Ontario Job Grant provides training grants to help employers enhance their workforce by upskilling new and existing employees. Ontario government funding can be used to offset the costs of providing third-party training programs. By investing in workforce development, businesses can enhance productivity and increase company capabilities. Eligible applicants may receive up to 66%-83% of eligible third-party training costs to a maximum contribution of $10,000 per trainee. Based on its recent success with Ontario training grants, Alpha Poly is taking a proactive funding approach for future capital investment projects and other strategic priorities. Currently, the manufacturer is planning a large-scale equipment acquisition project to increase the business’ product offerings. The company has already started looking for government grants and loans to reduce investment costs and accelerate project timelines. Ontario business owners and executives should continuously look for ways to access government grants and loans to help accelerate business growth and development. 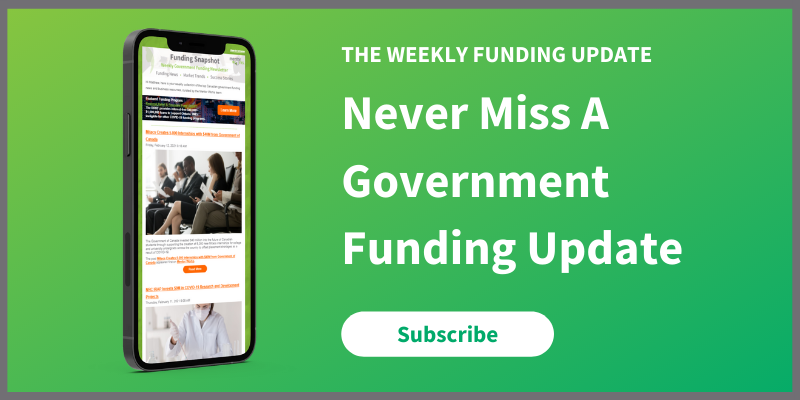 By staying up-to-date on current government funding programs, business owners can ensure they never miss an opportunity to leverage small business grants.